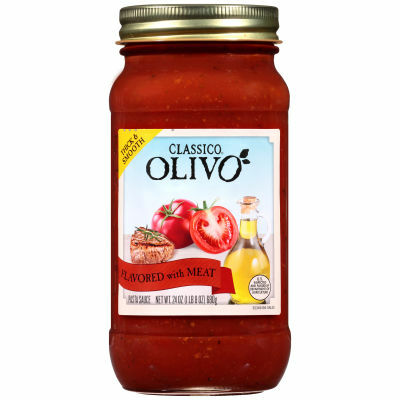 Classico Olivo flavored with Meat Pasta SauceClassico Olivo flavored with Meat Pasta Sauce is made with original Italian flavor. Diced tomatoes soaked in tomatoes juice are gently cooked in Olive oil which gives a perfect aroma to the sauce. Finely cooked beef crumbles are blended with Romano Cheese to create all natural flavor for your favorite Meat Pasta.A sauce for every PastaThis sauce goes perfectly with your all favorite pasta. Just boil pasta and simmered in this flavorful Classico Olivo flavored with Meat Pasta Sauce and makes your pasta heavenly delicious with true taste of beef crumbles. Mix it with long strips of spaghetti or put it together with small chunks of rigatoni this sauce will gives all unique exotic taste. Serving size 1/4 Cup (125g).